I grew up in the 80s when Roger Moore was the popular choice to play James Bond. 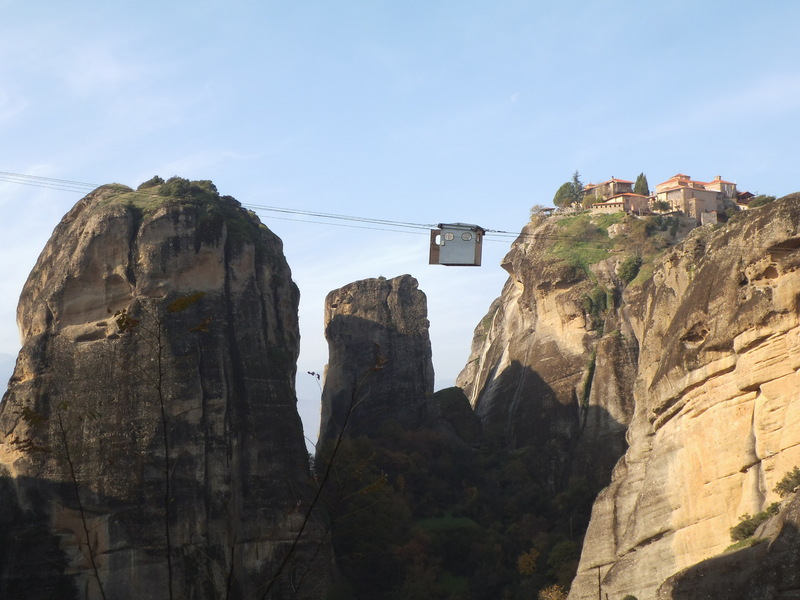 In the 1981 Movie ‘For Your Eyes Only’, the climax of the film featured an amazing rock climbing stunt with the monasteries of Meteora as its backdrop. Apparently the monks were not that impressed with their domain being invaded and tried to disrupt the filming by hanging out their laundry during takes. In fact, the interior and some of the exterior scenes were shot on a set in Pinewood Studios, England. 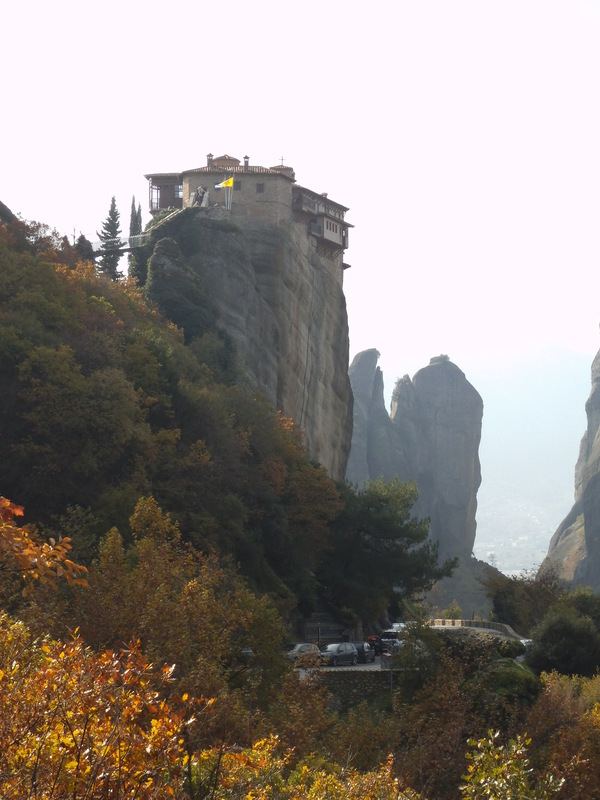 I set out to visit Meteora from the village of Kastraki where I hope to catch the 9am bus up to the highest monastery. It turns out that I’m over two weeks too late for any bus but then a miracle occurs. George pulls up in his taxi and offers to take me for only €3. He already has two Spanish girls in the back so I’m really just a bonus for him. 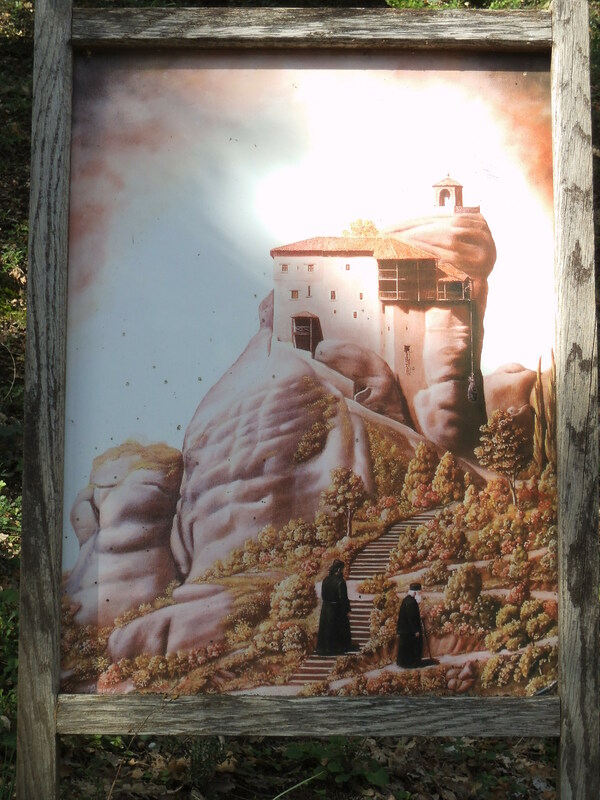 He points out ruined monasteries as we swerve up the road and gives information about the monks and nuns who live in the monasteries which remain in use. We pull up at Megalou Meteorou just as two coaches are disgorging their loads, so I hang back and wait for the crowds to clear before descending and ascending the numerous steps. 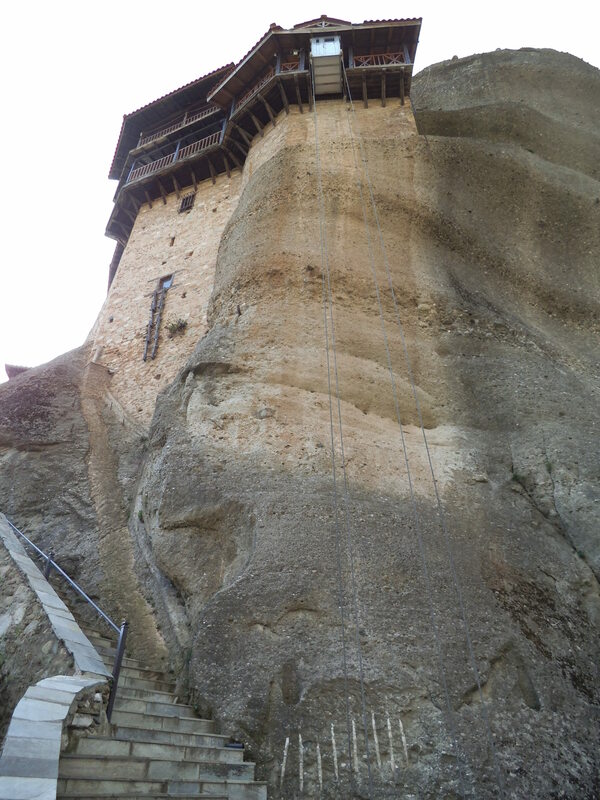 Megalou Meteorou is the highest and luckily the largest of the monasteries so it’s easy to avoid the other visitors. In fact, I’m surprised by how much there is to see. 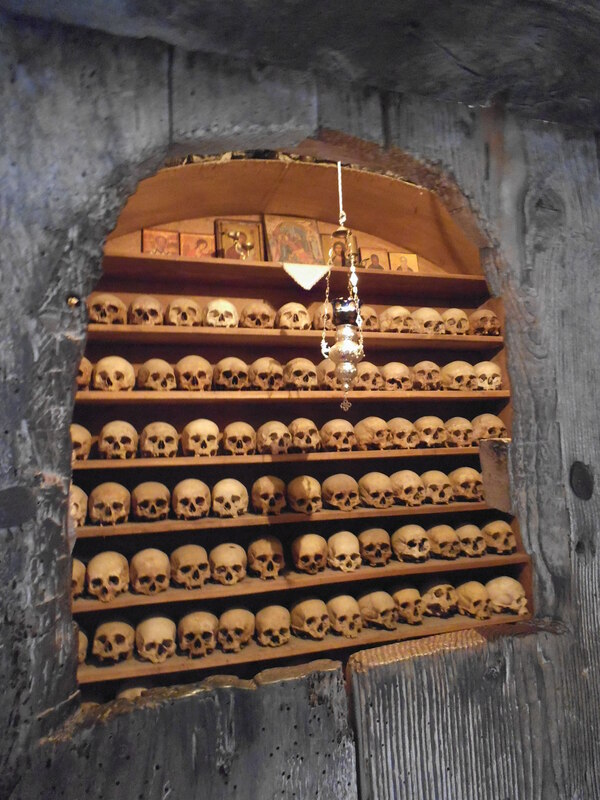 Various museums, a carpentry room, the smoke-blackened kitchen, a shop selling soap, honey and religious items, a creepy ossuary, as well as the main chapel, or Katholikon as it is known. The main theme of the 16th century frescos are the martyred saints who were killed for not renouncing their Christian beliefs. 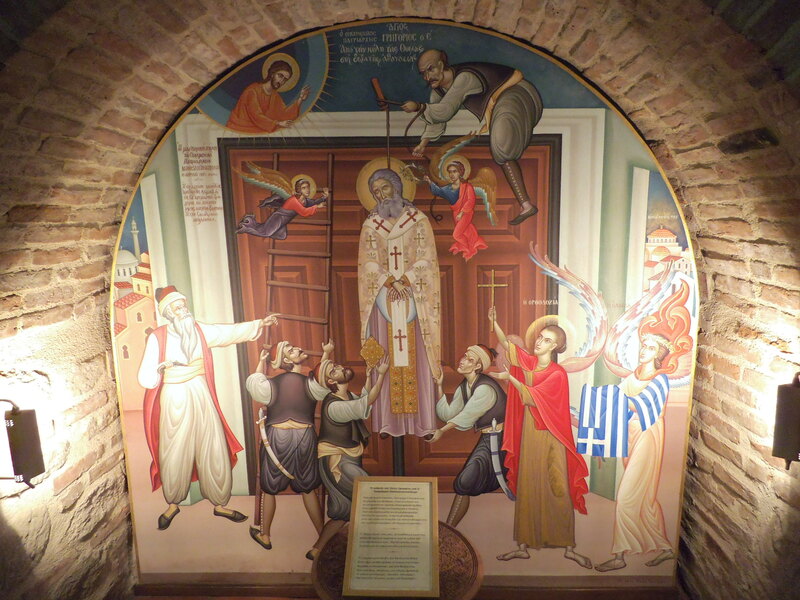 Scenes of their hanging, beheading, dismemberment and crushing with stones adorn the walls while haloed icons gaze up from their frames and incense fills the air. A little further down the road is Varlaam, one of the earliest monasteries to be established in the region and with an impressive old ascent tower and modern electrical cable car which I get to see in action. Today it is only being used to transport building materials for restoration work taking place on the large exterior patio. These days visitors use the steps carved into the rock and bridges which span the chasms. However, when Patrick Leigh Fermor visited in the 1950s he ascended by the ancient windlass mechanism. When he asked the abbot how often the rope was replaced, he was simply told, ‘When it breaks’! Very few monks now actually reside at the monasteries but there are a flourishing community of nuns living at Ayiou Stefanou and Roussanou. 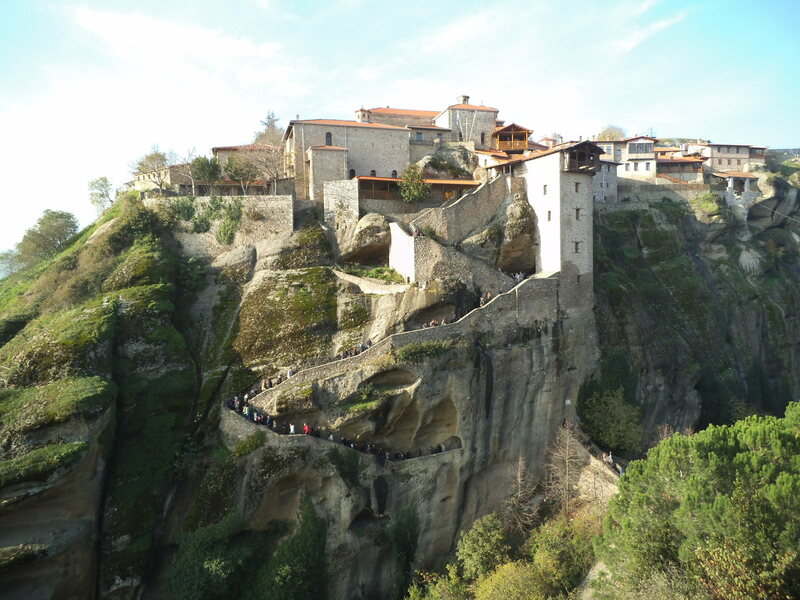 The steps up to the small but precipitous monastery of Roussanou are steep and the two bridges narrow and worn, but the nuns seem quite content there, producing honey and worshiping Saint Barbara, whose relics are kept in the chapel there. 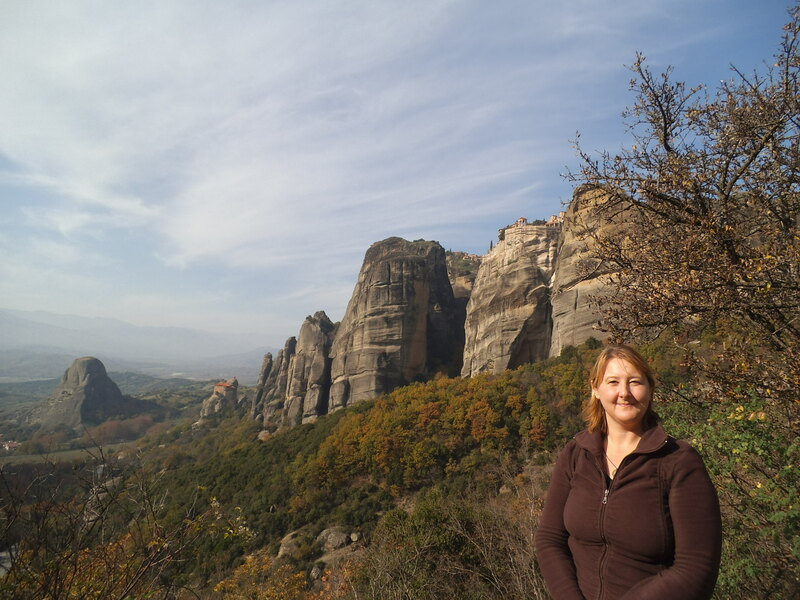 The Spanish girls declare that they are too tired to attempt the ascent to the last monastery on our route back to Kastraki so I climb up to Ayiou Nikolaou alone. 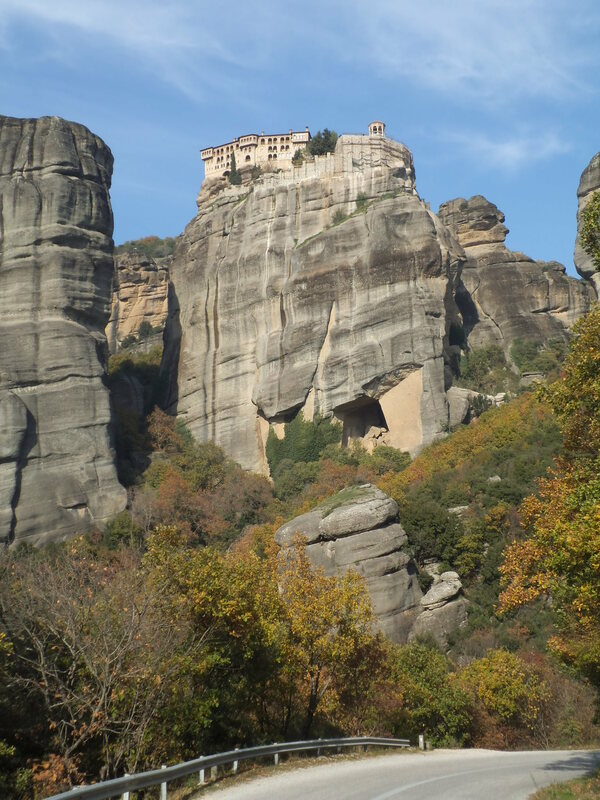 For me, this monastery turns out to be the most authentic that I visit, with only one elderly monk in residence and a small katholikon that doesn’t actually have the gruesome scenes of martyrdom. 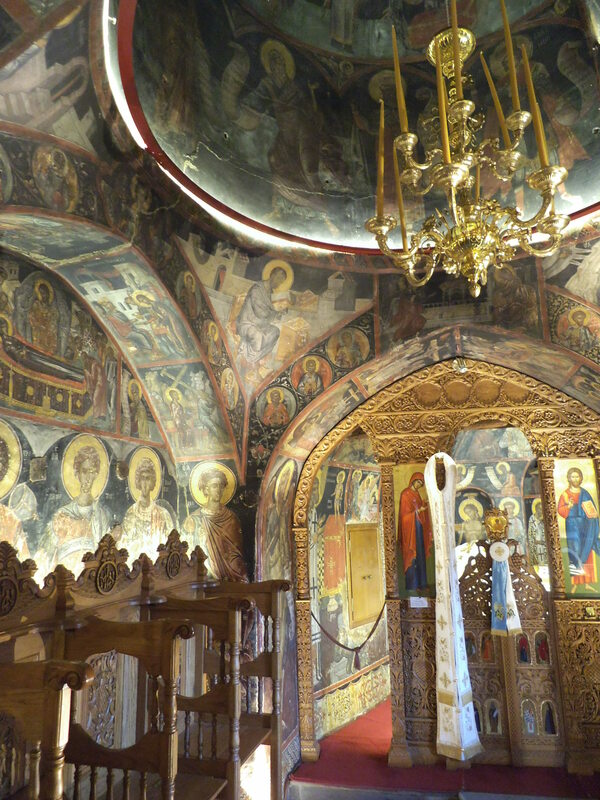 Instead the walls are decorated with more positive scenes depicting monastic life and episodes from the Old Testament. As I climb up to the patio and bell tower at the very top, I can hear the monk praying in a back room somewhere, and when I see the stunning view back down the valley I can understand why all those years ago they chose the arduous task of constructing their places of worship on the top of these monolithic rocks. So they can be as close to heaven as possible. 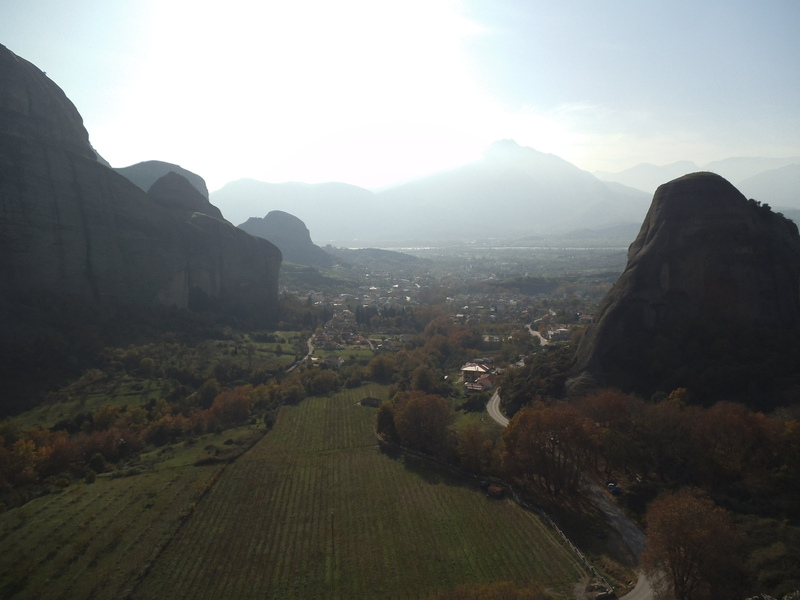 This entry was posted in Film, Greece, Religion and tagged European Nomad, europenomad, For your eyes only, Greece, James Bond, Meteora, Monastery on November 28, 2016 by A Nomad.